A Michigan high school basketball team still mourning the sudden death of its 16-year-old star player has decided to play as scheduled Monday when the state tournament begins, The Detroit News reports. The Fennville Blackhawks will compete in the Michigan High School Athletic Association boys basketball state tournament just days after Wes Leonard died. Leonard collapsed after scoring the victory shot in a game Thursday that secured the Blackhawks’ perfect season. On Thursday night, Leonard, a junior, died of a heart attack after scoring the winning layup in Fennville's 57-55 victory over Bridgman. 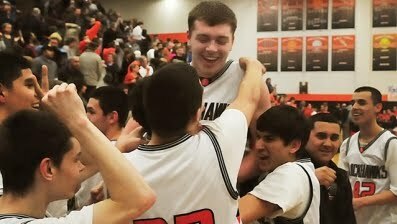 It capped a perfect 20-0 regular season for the Blackhawks and further cemented Leonard's status as Fennville's unquestioned star. A day after Leonard died from an enlarged heart, this small town near Lake Michigan remembered an "all-American kid" whose athletic heroics had been local legend since middle school, when opposing coaches sometimes asked to see his birth certificate, reluctant to believe that someone so young could be so skilled. "He was a good kid, a good friend to have and a good person to hang around with," DeMarcus McGee, who played football and basketball with Leonard, said between sobs. "You never thought it could be him. He was so healthy. It shouldn't happen." My cousin and her family live in Fennville - she coaches the brother of Wes in baseball. Such a sad story - but praying for God's peace to comfort them all!